Become La Monita Official Fans today! We are now launching "La Monita" application, a vertual memebership loyalty program, to benifit of our fans. 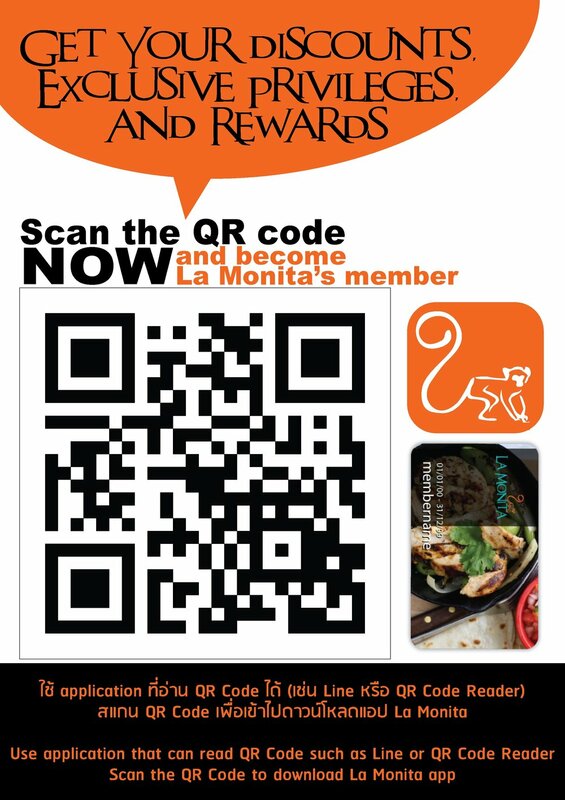 You can download it buy scaning QR code or search La Monita on App Store or Google Play and enjoy discount, free items or updated promotions and news or even get into our ritual talk of the town - the La Fiesta Monita -for free! Also every 600 THB spending at La Monita, you'll earn a point and the more points you get the greatest prize it would be in cluding an annual discount card for dining at every branches of La Monita and Osito. Download now to to get 15% discount for your next visit at La Monita Taco Truck or La Monita Mexican Urban Cantina and special chips and salsa for free on us from now until January 31st, 2017. We hope you'll become our official fans soon! Scan QR code to be a our official fan!